Ideum, a U.S. based company that's known for designing and creating interactive computer-based exhibits and multitouch installations, has unveiled a new multi-touch table called the MT55, adding to its already existing MT55 PROTouch Table, the major difference being the dimensions and thus the hardware. 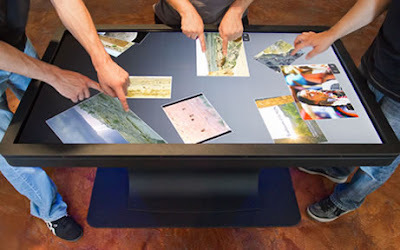 1] Its said to be the Thinnest Mutitouch Table in the market. 2] It has optical touch system, capable of handling 32 touch points at the same time. 3] It has a 55″ 1920×1080 HD display and has a 5,000,000:1 contrast ratio. 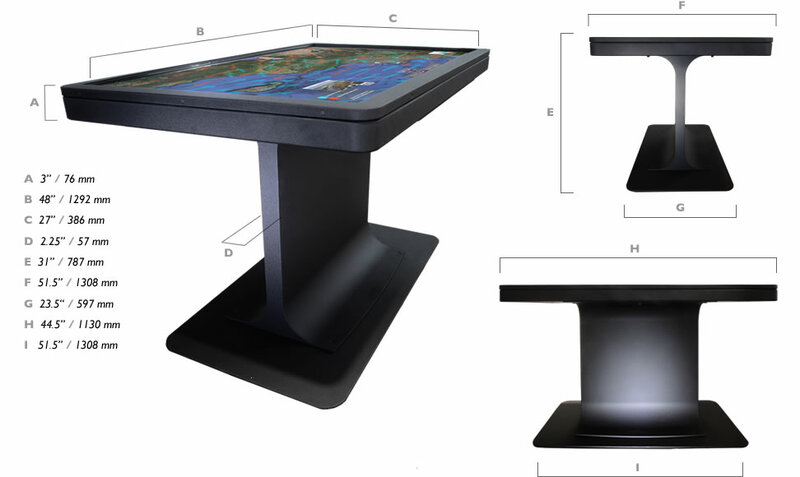 4] It has a wide 178-degree viewing angle accommodates multiple users around the table. 5] The top profile is a mere 3 inches (76 mm) thick and the underneath support just 2.25 inches (57 mm) thick. 6] It also has something called Micro-etched 'HapticGlas' which provides tactile feedback, reduces fingerprints, increases scratch resistance, and directs user focus. 7] The multitouch table is 31″ tall, which makes it ADA (Americans with Disabilities Act) compliant. 9] Its made of aircraft-grade aluminum and cold-rolled steel. 5] Despite its size it consumes a mere 400 watts at peak usage. 6] For connectivity it has Direct access via USB 2.0 ports,WiFi Bluetooth connectivity and Ethernet. 7] It has GestureWorks SDK (with support for over 200 gestures, and a number of pre-built Open Exhibits components included). Now that all the good things have been said, this table top is a costly proposition. It is priced at USD $17,950, if you want to upgrade to the Intel Core i7 and the 256GB SSD, it will set u back another $750. Also the Micro-etched 'HapticGlas' is not standard and will set you back another $1000. The one major problem I feel is that this table doesn't have a dedicated graphic card (GPU) rather it relies on the integrated one, which is kinda weird for a system for which you are going to pay roughly $18000+. Of course its not something you will find in everyone's homes, its actually more intended to be set up in public places. For now they only ship in United States and Canada. International shipping will start in a years time.